Amanda Faber goes into the "Finals Week" signature challenge feeling excited about creating a Southern-style American Biscuit. 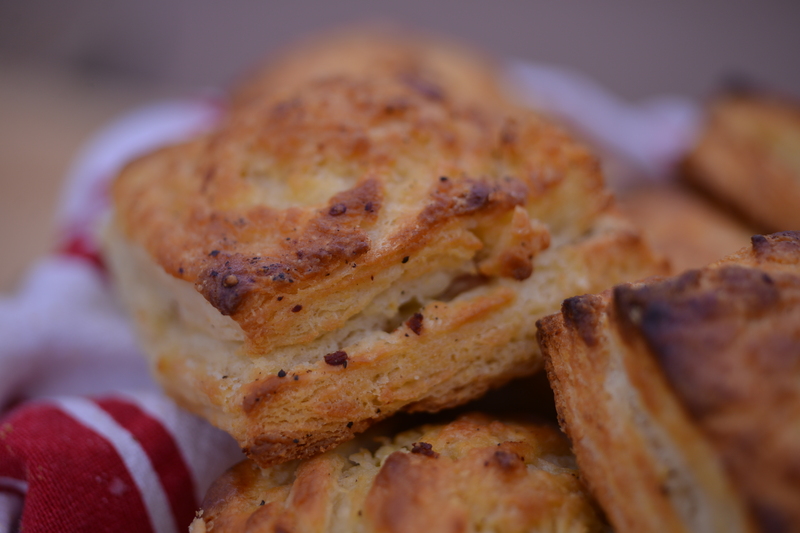 Amanda says biscuits remind her of being home in Atlanta with her husband and two children. These biscuits are enriched with honey and milk, and filled with fresh tarragon and a mustardy ham and cheese filling. Her meld of interesting flavors and attention to detail have kept her in the challenge leading up to "Finals Week" but will it be enough to wow judges? Watch the full episode of "Finals Week" from The Great American Baking Show Season 2 episode 8. 1. Pre-heat the oven to 450° F/232° C.
2. Finely chop the tarragon. 3. In a large mixing bowl, combine the tarragon, flour, baking powder, salt, and cream of tartar. 4. Using a pastry cutter, cut the cold butter in until pea-sized. 5. Stir in the honey and milk with a fork until a dough forms. 6. Turn the dough out on to a floured surface. Roll until about 1/4 inch thick. Thin! 7. Cut 24 squares or rectangles, about 2x2 inches. 1. In the bowl of a food processor, combine the Dijon mustard, deli ham, gruyere cheese, and tarragon. 2. Pulse until almost a paste. 3. Taste and season as needed. 1. In a small bowl, whisk to combine egg with 1tbsp of water. Set aside. 2. Moisten the edge of a biscuit. Fill with ham mixture. Top with biscuit. 3. Repeat with each biscuit and place on a large baking sheet lined with a slipat. 4. Brush with prepared egg wash.
5. Bake until golden brown, ~12 minutes.